At Living Lord Lutheran Church, we worship God in a variety of worship settings and times that appeal to different worship preferences. We offer several different styles of liturgy and music, including traditional, contemporary, and combinations of both. Living Lord is a family-friendly congregation. Parents may leave their small children with our paid nursery staff if they desire, or bring them into worship. We do ask parents to periodically volunteer to help our staff in the nursery if they plan to use it regularly. We also offer “quiet bags,” filled with activities to keep kids busy, as well as children’s Bibles to bring into worship. 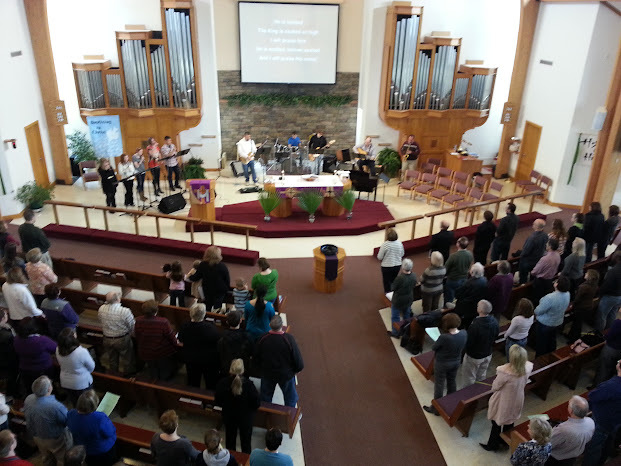 Saturday worship offers a wonderful and meditative musical setting for evening prayer and communion. Beginning close to sunset, this service is often accompanied by candlelight. About once a month a folks are invited out to dinner following the worship service, at a local eatery. Lutheran Worship (the Red Book). In addition to singing classic and new hymns, the congregation also enjoys regular musical offerings by Living Lord’s traditional choir, the Praise Singers, and special music by soloists, instrumentalists, and ensembles. This service offers worship with a contemporary flair! Creative elements are used in a heartfelt style to prepare worshipers for the morning’s message. The music selection represents modern trends of worship music within the seasonal and liturgical structure of Lutheran worship.